The Clé de Cartier watch gets its name from a crown that resembles a key. And Clé has the meaning of “key” in French. Cartier, which is based on avant-garde and fashionable feature, puts the idea of making a wristwatch into the time when the watch was winded and adjusted by the key. This is why the classic and mysterious key is incorporated into the new wristwatch. And this is the impressive Clé de Cartier watch. Moreover, the watch with sapphire has become one of the most recognizable and influential collections. However, this article is going to appreciate the new Clé de Cartier that was launched in 2017. The noble purple watch band is combined with the soft rose gold case and the dial with diamonds. From the appearance, the bright and elegant appearance of the new products can be displayed perfectly. Tracing the history of this series, Cartier launched the Clé de Cartier series in 2015. This series combines the lines of the early pocket watch and winding action into the design of the wristwatch. It also designed a unique crown with the square shape and convex sapphire. Then, the sapphire crown became the symbol of this series, which is still regarded as a classic item by the horological lovers. The watch is designed to follow the elegant style of the series. The 31mm 18K rose gold case after polishing process presents a delicate texture and smooth radian. And it is integrated with delicate ears. The same material crown with a sapphire has ornamental value and brand recognition. From the side of the wristwatch, you can see the thick and full watch bezel and the elegant dial. The white dial is decorated with guilloche pattern. 10 bright well-cut round diamonds appear on dial as time scale. And the square base shows the delicate details processing. Two blue sword-shape pointers in the center of the dial and diamonds scale make the time direct and clear. At 6 o’clock, there is also a calendar display window that can show the connotation of women. The new Cartier 1847MC type automatic wind movement, which is produced and assembled by the master of Cartier, is placed inside the wristwatch. More, the movement is decorated with Geneva ripples. With 25.6mm diameter, two-way self-winding and 40 hours of power storage. In addition, the case back with a dense process design can well protect the safety of the movement. 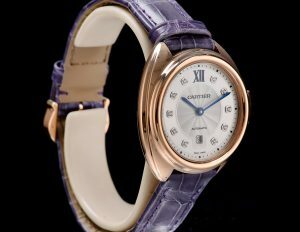 A bright purple alligator leather strap with 18K rose gold pin buckle is comfortable to wear. Simple and elegant pin buckle design is not only beautiful, but also can protect the safety of the watch on the wrist. 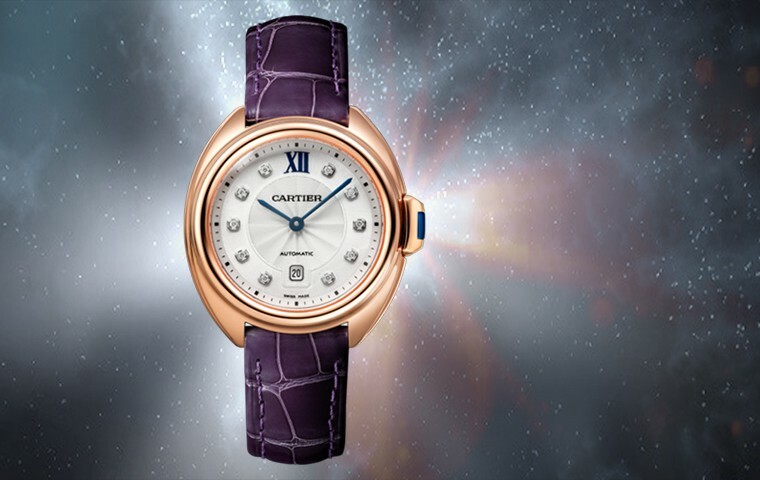 On the whole, this Clé de Cartier fully presents an elegant, low luxury and brilliant side. No matter from which point of view, the details of the handling in place make the watch has a full ornamental value. At the same time, the built-in brand self-made movement highlights the precise characteristic of the timepiece. So, women who love this watch can think about it.